WEST LAFAYETTE, Ind. 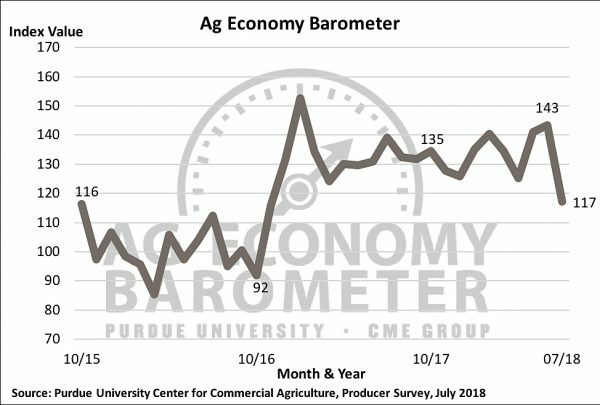 — The Purdue University/CME Group Ag Economy Barometer declined 26 points, down to 117, in July, making it the largest one-month decline in producer sentiment since data collection began in October 2015. The Ag Economy barometer is based on a monthly survey of 400 agricultural producers from across the country. The drop in sentiment was fueled by increasing trade war concerns and decreasing commodity prices. “This summer,we’ve seen tariffs placed on imports of U.S. ag products by China and Mexico that are impacting producers’ bottom line,” said James Mintert, director of Purdue University’s Center for Commercial Agriculture. He said the most recent survey asked producers whether they expect to see their net income decline as a result of trade war conflicts. Over two-thirds of respondents indicated they expect to see lower income because of trade conflicts, with over 70 percent of them expecting a net income decline of 10 percent or more. Sharp declines were also recorded for the Index of Current Conditions, which fell from 138 to 99, and the Index of Future Expectations, which fell from 146 to 126 in July. “Commodity prices dropped sharply in June and July, and there is real concern among producers that those prices will remain low and, possibly, fall even further,” said Mintert. 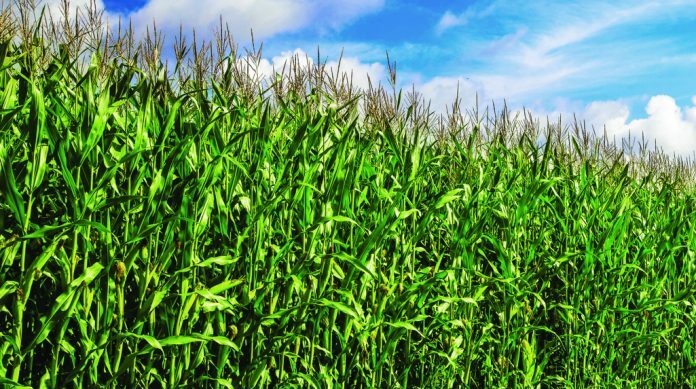 the July survey, approximately 4 out of 10 producers stated they think it’s likely December 2018 corn futures will trade below $3.25 per bushel and November 2018 soybean futures trade below $8 per bushel between mid-July and this fall. The negative outlook on commodity prices spilled over into farmland values as well, with 31 percent of producers saying they expect lower farmland prices over the next year. Farmers also became more apprehensive about making large purchases, as 73 percent indicated it’s a bad time for large farm investments.